Choir of London hasn't added a story. More a collective than a choir, the Choir of London is a flexible community of musicians who create change, harnessing the energy and commitment of outstanding professional musicians to develop access to music in places that need it the most. Since 2004 it has toured five times to the Middle East, focused on the Occupied Palestinian Territories, engaging with over 1500 local and visiting musicians. It has established a Bursary Scheme for the best young Palestinian musicians to experience musical life in the UK. And it has generated, stimulated and enabled cultural transformation in the areas where it has worked, contributing to a renaissance in musical life in Palestine. Festivals run by the Choir in Palestine bring international musicians and touring productions to interact with local musicians, groups and schools: the Palestine Choral Festival in August 2013 saw 25 Palestinian choirs partnering with 5 international choirs for 10 days of rehearsals, workshops and concerts. The Choir celebrates its tenth anniversary in December 2014 with a performance of Sir John Tavener's 'Lament for Jerusalem' as part of Spitalfields Music's Winter Festival. The choir first performed the work 10 years ago at Christ Church Spitalfields in its very first concert, and went on to perform Tavener’s ‘Jerusalem’ version (arranged especially for the choir) across the Middle East. Since 2008 the Choir of London has brought 17 young Palestinian musicians (aged between 14–18) to the UK as part of the Choir of London Bursary Scheme. Each year under this programme a number of students are chosen by audition to travel to the UK for the experience of a lifetime, spending 10 days in London and the British countryside attending a residential music course and studying intensively at the Royal Academy of Music. This programme serves as an important 'stepping-stone' in the development of young musicians, many of whom at the time of participating in the scheme are on the brink of choosing a career in music. Coming from a situation of such isolation, there is valuable perspective to be gained from playing with musicians their own age from the UK, whilst working intensively with professional musicians and teachers at the Royal Academy of Music gives a taste of the life of a music student. The programme also provides opportunities to explore musical styles that are under-represented in Palestine: past students have enjoyed workshops in baroque performance, electronic music and songwriting. Click here to go to the Choir of London's website for pictures, videos and stories about the the Bursary Scheme programmes we ran in 2008 and 2012–14. 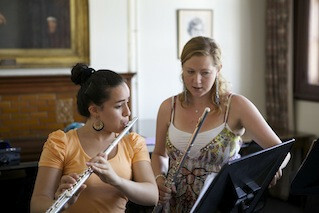 Alumni of the scheme include cellist Naseem Alatrash, currently studying at Berklee College of Music (USA) on a Presidential Scholarship; violist Marina Eichberg, now entering her second year of training at Köln Hochschule für Musik; and Lina Sleibi, who sang on stage at the Wigmore Hall in 2008 with the Choir of London aged 15 and is now enjoying a successful singing career in Palestine, Bahrain and across the Arab world. The Choir of London now seeks to fundraise to continue this increasingly important work. For the last three years the programme has enjoyed the support of the British Council, but this limited-term funding has now come to an end. As music education continues to flourish in Palestine, and an increasing number of eligible students are applying for a place in the scheme, the Choir of London is reaching out to its friends and supporters for their help in ensuring that more talented young Palestinian musicians are given an opportunity that could put them on the path to a career in music. The Bursary covers all associated expenses of the students' trip to the UK: visas, international travel, orchestral course fees, accommodation in London, living expenses, tuition at the Royal Academy of Music, excursions, concert visits and 24-hour chaperoning. Together with additional overhead costs including auditioning the students in Palestine and providing them with a culminating concert experience in London at the end of their stay, the total cost of the scheme per student is £7,500, meaning that to be able to welcome four young musicians to the UK in summer 2015 we need to raise £30,000. Funds raised over this £30,000 target will be put towards enabling the Choir of London to engage with more young Palestinian musicians, by opening up the Bursary Scheme to more students and through the development of education programmes linked to forthcoming projects. In the event that the target is not met, fewer places will be made available according to the amount raised. Please help us to continue to offer this important opportunity to talented young Palestinian musicians. We hope you will join us in welcoming them to the UK next summer! 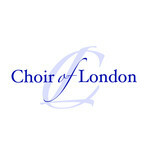 Choir of London hasn't posted any updates yet. Choir of London is managing the funds for this campaign.